When it comes to residential or domestic chainsaws, most people use them to cut firewood or perhaps trim their trees and clear dead limbs. Luckily, the market has seriously diversified lately, so there is something for everyone out there. There are all kinds of chainsaws in commerce and although they do look similar in features and specifications, they come with plenty of differences. Making a random choice is likely to cause some frustration sooner or later, hence the necessity to do your homework. Find the best selling products, check the front runners and read some reviews. 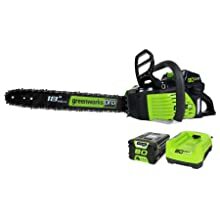 Now, what is the best chainsaw for cutting firewood? Husqvarna 450 18-Inch 50.2cc X-Torq 2-Cycle Gas Powered With Smart Start comes with a top-notch 3.2HP X-Torq engine. It is gasoline powered and measure 18 inches. The patented LowVib technology is one of its most attractive features. Vibrations are almost null, so you benefit from extra comfort and precision. Even when it comes to starting this unit, the Smart Start feature makes it a breeze. It also features an inertia activated chain brake, not to mention the centrifugal air cleaning system. As it is CARB compliant, it can be commercialized in California too. Husqvarna 460 Rancher 20-Inch 60.3cc 2-Stoke X-Torq Gas Powered is yet another CARB compliant unit from the popular manufacturer. It comes with a 20 inch long bar, as well as extra features for convenience. For example, it features a quick release air filter for simple maintenance and replacement, not to mention a chain tensioner on one side that does not require any tools at all. It is tough, durable and ready to face heavy duty operations due to the forged three piece crankshaft. Tanaka TCS51EAP 50.1CC 20-Inch PureFire Engine has a fancy commercial grade motor that offers a top-notch performance, as well as a clean and fuel efficient operation. It has a decompression valve and a primer bulb. Warming up is fast and simple, while starting the machine should not pose any problems. The oiling system is adjustable and automatic – just make sure that you got enough oil. Finally, when it comes to thin firewood and extra control, the sprocket nose bar and bumper spikes are there to help you out. Echo CS-590 20″ Timber Wolf Chainsaw is ready to take down most types of firewood. It is designed for heavy duty uses, so it can easily help in any kind of operation. It has a 59.8cc professional grade two stroke engine. The performance is simply incontestable. As for the bar, it measures 20 inches in length – more than enough for large logs as well. The decompression valve is another handy feature because it ensures easy rope pulling. It weighs 20.1 pounds, so maneuvering it should not be such a big problem. GreenWorks GCS80420 80V 18-Inch Cordless will surprise you with its autonomy. Basically, a fully charged 2AH battery can support you for up to 150 cuts. The battery is included in the package too. The DigiPro motors are reliable and can easily compete against gasoline powered engines. You can also count on a chain brake feature for safety, as well as a durable metal wrap around the handle. Recharging the battery takes less than 30 minutes – just in case you have a lot of logs to cut and you run out of power. As it is battery powered, it obviously weighs less than gasoline powered alternatives – just 10.8 pounds. It is compatible with more batteries though. 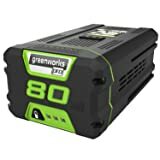 is compatible with more models from GreenWorks. It takes about an hour to get fully recharged. It has a LED light that indicates the remaining power as well, not to mention the fuel indicator. The best part is that the power does not fade away as the battery drains. 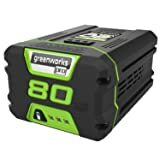 GreenWorks GBA80200 80V 2.0AH Lithium Ion Battery carries similar standards, only it takes less to charge – just 30 minutes – and offers less running time for a charge. Just like the other model, it has LED lights to indicate the fuel and remaining power. 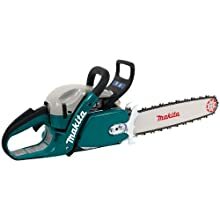 At the same time, its power does not go away with the energy, so you can use the chainsaw for cutting firewood at the highest standards. Makita DCS5121 50cc – 18-Inch is less likely to disappoint you with that 33HP engine. Do not let yourself fooled by that compact size though. Sure, it weighs only 12.3 pounds, but it has an outstanding ratio for power to weight. In terms of safety, it comes with a two point inertia and mechanical chain brake, which stops the blade in case of abrupt movements. Small details add to the overall convenience. The fuel and oil tank has large openings, so there is no way to face any frustrations while filling up. Other than that, stability will never be an issue with the impressive metallic spike bar. It adds to your precision, but it also keeps the chainsaw straight for all kinds of operations. Chainsaws are automatic. From this point of view, a chainsaw can do in a few seconds what you might do in a few hours with a classic manual saw. In other words, the speed is the most important advantage of these things. When cutting firewood, some people use classic saws, while others rely on axes. Each of these options will take a long time, especially when you cut wood for the entire wintertime and not just for a few nights. Using a chainsaw will drastically reduce the time. On a different note, the effort is not to be overlooked either. It is one thing to keep pulling and pushing and a different thing to go through a log within one or two seconds. Imagine using an ax too. You have to go up and down with that heavy tool, but also hit the log correctly. It takes a few minutes to end up with a terrible back pain and a lot of pressure on your arms. Sure, with practice, these things become normal, but they will still exhaust you. After cutting firewood for a few evenings in a row, you do not feel like doing anything else at all. The risks are not to be overlooked either. If you fail to hit the log correctly with an ax, it can go into your knees. However, chainsaws do have a few drawbacks as well, especially when it comes to safety. You better hold them firmly or you end up with the same risks – cutting yourself. Modern units do come with a lot of safety features though, so you are relatively safe. Another drawback is that they cost more than just a traditional saw or an ax. Think about the firewood when about to get a chainsaw for such operations. Your necessities dictate the best choice. Some people rely on hardwood, which obviously demands a more powerful chainsaw. Some others go with softwood, which can be easily cut with less power. It also depends on how large the logs are. How much do they measure in diameter? How about their thickness? All these things dictate your actual needs. When you know these details, you will know exactly how powerful and large the chainsaw for cutting firewood should be. Do not overlook your available budget either. Although you might find some really cheap things in commerce, focus on the value for your money. 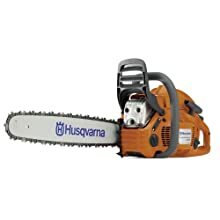 Buy the best chainsaw that you can afford. Otherwise, a cheap model might quit on you during the first winter. Make sure that you know the differences between electric and gasoline chainsaws for cutting firewood. 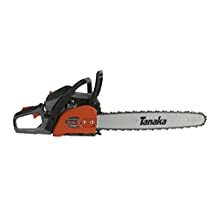 Most chainsaws come in one of these models. Electric saws do not weigh too much. They are excellent for limbing, as well as cutting small logs or softwood. However, you are limited in movements by the electric cord. 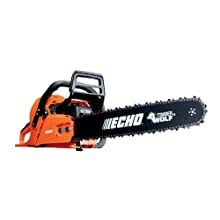 Gasoline powered chainsaws are larger, noisier and more powerful. As for the size, count the cutting bar length, which is usually directly proportional with the motor power. Normally, these things vary between 12 and 20 inches, yet professional models go even higher. Plenty of people do take the brand in consideration as well. Sure, you should not get a nameless model that no one has ever heard of, but focus on a reliable and world renowned manufacturer. Pay special attention to safety features as well, not to mention the maintenance and durability. The more automatic the maintenance is, the better. As a short final conclusion, finding a good chainsaw for cutting firewood might look easy, but it is a bit tricky. It is imperative to do your homework upfront. Buy the wrong chainsaw and you will waste a lot of time going through firewood. A few reviews can open a lot of doors, as you basically learn from others’ experiences.